Surinam Airways cargo offers reliable transportation of live animals to and from all its destinations and beyond with other carriers or via trucking companies. It is mandatory that all live animals precautions that are required within the country of origin and destination should be taken into account, prior to shipment. Live animals shipments are subject to live animals regulations. 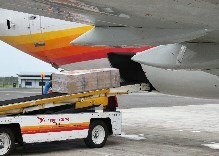 Surinam Airways cargo has an embargo on shipments of primates to and from all destinations and birds, fowls and reptiles to Amsterdam (Europe).